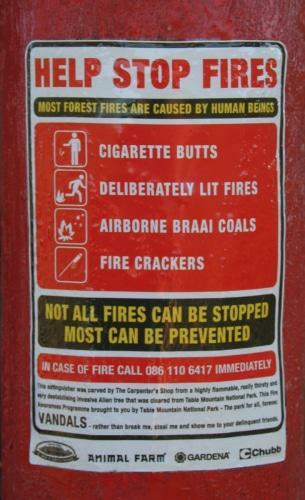 Walking in the veldt the other day I noticed this rather odd looking fire extinguisher. To my great delight it was not a real one but one carved out of wood. This completely perplexed me but later it was kindly explained to me: the purpose of the wooden fire extinguisher is obviously not to put fires out but to help ‘stop’ fires by reminding people of the do nots and giving the emergency call numbers. I think this is such a clever and proactive idea! 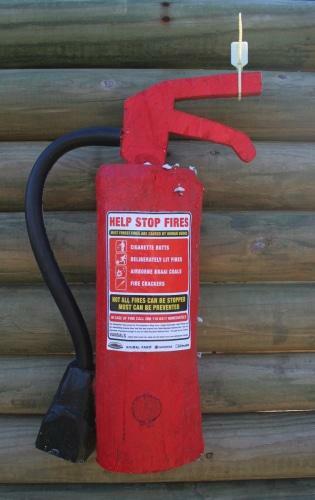 This entry was posted in Blog and tagged bush fires, clever idea, fire deterant, Fire extinguisher, fire signs, fires, south african fires, veldt, wooden fire extinguisher. that’s a rather cool programme! Vandals! show me around! They are so clever. It took me a year of driving past those to actually realise they were not real! Hi Wendren!Yes, I can say the same like the other comments before…Those are so clever. What a great idea! I love it. But why would it suggest to steal it? Great idea, but I see a lawsuit in future…filed by someone who wanted to use it to put out a real fire. i don’t know about you guys, but if i ran there thinking it was a real fire extinguisher, and i happened to need one, i’d be pretty pissed. @Heather – nice! Thanks for pointing that out…off to visit them shortly. @Davey – wouldn’t you rather see it stolen, and shown around, and needing to be replaced, rather than smashed to the ground on the spot? I agree, neither are ideal situations, but I’d rather see it gone on to another use (perhaps inspiring future designers?) than trashed on the spot. 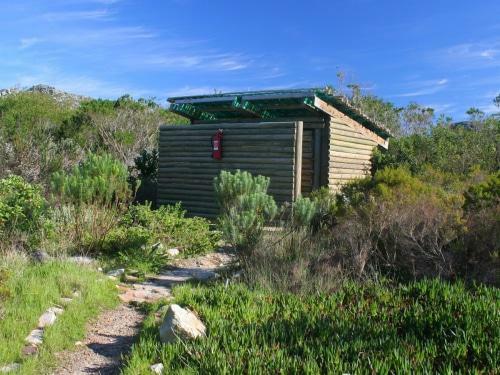 Thanks for this great post – I love the wooden fire extinguisher, and particularly enjoyed that last message (both the bit about the highly flammable destabilising invasive alien – damn those gumtrees, damn those port jacksons! – and the message to the vandals)! Cool idea, but what would happen if some one really needed one? Hi there. I think it is brilliant! Too solve the issue of needing an extinguisher in an emergency, I suggest painting it yellow or blue. And to hang a real one next to it! LOL, what a great idea.